The 12th Annual Webby Awards have announced their Nominees and Honorees today. 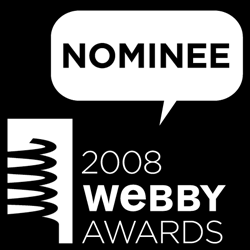 We are excited to announce that Laughing Squid has been nominated for a Webby in the Culture/Personal Blog category and we are in very good company. Laughing Squid is also eligible for The People Voice Awards. Voting starts today, April 8th and ends on May 1st. You can vote for Laughing Squid and other nominees through the online ballot (registration required). Here’s our nominee page. Winners for both awards will be announced on May 6th and honored in New York City at The Webby Awards June 8th through 10th as part of Internet Week New York. UPDATE 1: Laughing Squid has a nominee page on The Webby Awards where you can add tags and leave comments. UPDATE 2: The Webby Awards also has a “Most Popular (Most Voted For)” page where we are doing pretty well along with our friends from I Can Has Cheezburger?.